With billions of dollars promised to “build Haiti back better,” why hasn’t it happened? The sad reality is that while the earthquake may have destroyed a significant part of Haiti, it did not destroy the predatory and exploitative imperialist system which has historically impoverished Haiti—it unfortunately intensified it. "Photo Credit: Foodfuel.blogspot.com"It has been two and a half years since a catastrophic earthquake struck Haiti in January 2010, and the failed reconstruction of the country has led many good-intentioned observers to ask how this could occur. With billions of dollars promised to “build Haiti back better,” why hasn’t it happened? The sad reality is that while the earthquake may have destroyed a significant part of Haiti, it did not destroy the predatory and exploitative imperialist system that has historically impoverished Haiti—it unfortunately intensified it. More than two years later, the reconstruction process has been a very lucrative undertaking for many private organizations. Haiti remains in ruins, with non-governmental organizations (NGOs) benefiting from the extreme privatization of the Haitian state, resulting in a patchwork system of services that are unaccountable to the Haitian people. While many articles appearing around the anniversary discussed and compiled the statistics about the faces of the failure, a deeper discussion needs to occur on why depending on NGOs and charities as a development model is dangerous, hypocritical, and totally unsustainable. That the presence of NGOs in Haiti and elsewhere is portrayed as an apolitical phenomenon makes the discussion problematic. Just as the presence of the Red Cross in a country is often seen as a symbol of transnational humanity in action, NGOs are often perceived as being inherently beneficial. 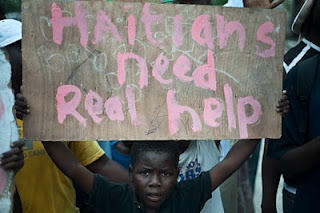 The reality in Haiti two years later reveals that it is much more complicated and a much more self-serving enterprise. Having so many organizations in the country can be considered as a symbol of the fundamental failure of the Haitian people and its culture. This pattern of discarding the Haitian government in favor of mostly foreign NGOs became a template for “development” in Haiti over the course of several decades as the government was regarded as too corrupt and inefficient to be trusted with foreign funding. In particular, the massive amounts of funding would go to these foreign organizations with no accountability to the Haitian people, and unlike the conditions imposed via structural adjustment on the Haitian government, there is no need to follow any procedures of transparency to show how or where the money is being spent. In regard to the international community leading by example in Haiti, it is a classic case of do as we say, not as we do. After the earthquake, the funding breakdown for the relief efforts reflected the extent to which the Haitian government had been sidelined. The Associated Press reported in early 2010 that of every aid dollar committed to Haiti for relief, only one cent would be directed to the Haitian government to help with the provision of services—with 75 cents going to USAID and the U.S. military. Despite this reconstruction plan becoming public knowledge, there was no outcry from the international community or major organizations working on the ground in Haiti, as this was not considered outrageous by any means but simply a continuation of the status quo. The hypocrisy of the international community on the issue of “helping build Haiti back better” did lead several high-level figures to publicly criticize the entire reconstruction plan and the myth of reckless Haitian corruption. The Organization of the American States dismissed Special Representatie Ricardo Seitenfus from his position in late 2010 for telling the truth about corruption and NGOs. The candid interview by Seitenfus, highlighting that the hypocritical and self-serving policies being enacted in Haiti were widely ignored by the international media earned him the Knight of the Republic Honours, bestowed by the Haitian government. Despite his comments, the issues of hypocrisy, the construction of corruption, and Haitian incompetence continue to provide endless fuel for the presence and justification of self-serving, undemocratic NGOs in Haiti.